Abstract: Stratigraphically important crinoid species Holocrinus acutangulus (Meyer) and Holocrinus dubius (Goldfuss) have been found for the first time in the Tatras, and the occurrence of Silesiacrinus silesiacus (Beyrich) was clarified. The following crinoid Zones: Dadocrinus, acutangulus, dubius and silesiacus, known from the Germanic Basin, are proposed for the Tatra Mountains. The Dadocrinus Zone is distinguished in the Tatricum and Fatricum complexes; both the acutangulus and dubius Zones are distinguished in the Tatricum complex, and the silesiacus Zone is distinguished in the Fatricum complex. The crinoid remains determined previously as Encrinus and Entrochus were found to have no stratigraphic value in the present state of research. The crinoids suggest a late Olenekian age for the limestones from Giewont, a latest Bithynian–early Pelsonian age for the limestones from Krzesanica and a middle Pelsonian age for the limestones of Ciemniak. The dolomites from the Filipka Valley quarry are dated as late Pelsonian–early Illyrian. Abstract: The basal bed of the Upper Turonian sediments at the Upohlavy Quarry, corresponding to clayey limestone in its character, bears obvious signs of rapid lithification from softground to firmground (Ophiomorpha–Thalassinoides–Spongeliomorpha). Immediately before reaching the firmground stage, the substrate was colonized by tracemakers of chemichnia (Chondrites). Biogenic reworking of the overlying, irregularly rhythmically bedded limestone/marlstone beds does not fit the idea that the differences between the limestone and marlstone ichnofabrics are due to primary fluctuations in oxygen content in water and in sediments. Documentation of a section of approximately 10–13 m above the base of the succession revealed that bioturbation down to the depth of ca. 20 cm is more intensive in beds with higher calcium carbonate content (Thalassinoides often passively filled with clay-richer substance and subsequently colonized by Chondrites tracemakers). Beds with lower calcium carbonate content are usually dominated by Chondrites but Thalassinoides, Palaeophycus and Phycodes are also present. These differences in ichnofabrics rather indicate a different succession of colonization (marls — Chondrites followed by Thalassinoides; calcareous beds — Thalassinoides followed by Chondrites filling the Thalassinoides burrows). Therefore, the consistency of the substrate and its increase through time after depositional events, and the content of primary organic matter widely used by the “homogenizers” of marly substrates were the decisive factors. After a partial compaction, the substrate was utilized by less demanding r-strategic substrate feeders (tracemakers of ichnogenus Phycosiphon) and lastly by chemosymbionts, which also made successful use of the trapping potential of abandoned domichnia. This situation (i.e. high concentration of fluids in abandoned tunnels) is also evidence of a considerable compaction and rapid diagenesis of limestones, allowing even surfaces of limestone beds to function as firmgrounds. Abstract: The Middle Eocene sequence in the Darende-Balaban Basin (Eastern Turkey) characterized by shallow and deep marine benthic and planktonic foraminiferal assemblages. Nummulites and other benthic foraminifers are common in its lower part (mainly in the conglomerates and sandstones) while the planktonic foraminiferal assemblages are abundant in middle and upper parts (generally fine-grained sediments). Acarinina bulbrooki Zone is identified within Middle Eocene strata in the study area. This biozone correlated with other Mediterranean, southern mid- to high-latitude successions where some similar species are recorded. Paleontological and sedimentological data presented in this study suggest that the Middle Eocene sequences are dominated by siliciclastic and carbonate sediments that were deposited in various environments ranging from very shallow (Korgantepe, Asartepe and Darende Formations) to deep marine (Yenice Formation) ones. Abstract: The paper documents Middle Miocene (Badenian) ostracods of the Polish part of the Western Carpathians for the first time. The material has been collected at the outcrop in the Kamienica Nawojowska locality, in the Nowy Sacz Basin. The ostracods allowed the identification of 42 species, referred to 26 genera and representing 15 families. Among them, a few species (e.g. Neonesidea cf. corpulenta (G.W. Müller, 1894), Pokornyella cf. devians Bonaduce, Ruggieri et Russo, 1986) and the genus Jonicythere Mostafawi, 1986, appear to be recorded from the Middle Miocene of the Central Paratethys for the first time. Some species show uncommonly high variability. Besides the ostracods, the associated remnants of green algae (Chlorophyta), assigned to three genera, are also preliminarily identified and illustrated. The taxonomic composition of ostracods, as well as their preservation state, and the associated green algae suggest their marine, shallow-water (inner neritic), rather highly dynamic and unstable environment. The close similarity of the recognized ostracod assemblage to those known from the Middle Miocene deposits of the others parts of the Central Paratethys (including the Carpathian Foredeep), Mediterranean areas, and the Atlantic border of Europe seems to be important. It suggests intensive exchange of fauna within these bioprovinces. Abstract: Accessory minerals play a crucial role in the petrogenesis of granitic rocks. They control the response of isotopic systems (U–Pb, Lu–Hf, Sm–Nd) and rule the geochemical variation of many important trace and minor elements during partial melting and fractional crystallization. 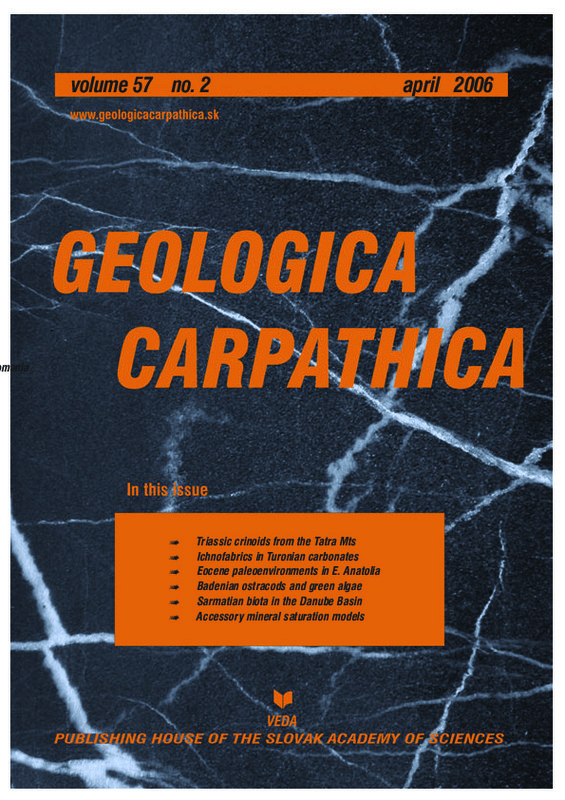 The experimental effort in the past thirty years has resulted in the formulation of saturation models with manifold applications in igneous geochemistry. Numerical simulations show that the zircon saturation thermometer is rather insensitive to analytical errors, the presence of a minor inherited component, as well as moderate accumulation of feldspars and some ferromagnesian minerals (Ca-poor pyroxenes, less so olivine). However addition of even minor cumulus Ca-pyroxene or Ca-amphibole would quickly render the calculated temperatures too low. Apatite saturation thermometry is a poor tool for felsic metaluminous rocks, being oversensitive to errors in the phosphorus determination as well as the presence of extraneous apatite. Even stronger element of uncertainty is added for peraluminous lithologies, when the increased apatite solubility is inadequately accounted for by the current models and where other phosphorus-bearing minerals, most importantly feldspars and monazite, come into play. The newly developed software Saturnin (http://www.gla.ac.uk/gcdkit/saturnin) written in the freeware R language performs otherwise tedious calculations of zircon, monazite and apatite saturation in igneous rocks. While the Windows users would probably find it easier to access the programme as a part of the larger package GCDkit (http://www.gla.ac.uk/gcdkit), on Macintosh and Linux it can be used as a stand-alone application.